One of my jobs at LensRentals is to predict the future. We have some flexibility, but in general we have to decide what to buy, and how many copies to buy, before an item is actually released. So I get to spend a few hours each day haunting the various forums and blogs, looking at what direction the camera world seems to be heading in. For many years one of the rites-of-passage for beginning photographers has been to learn lighting. And learning lighting meant learning strobes. One of the separating points between amateur and professional photographers was the pro’s ability to know exactly what lighting would be required for a given shot, set it up quickly, and with a bit of metering and a few test images, be ready to shoot. Strobe lighting really is remarkable: even a battery powered shoe-mount unit can project significant light 50 or 100 feet away. A set of AC powered strobe lights can put out light as strong as sunlight over a fairly broad area. And those of you (not me, you) who are proficient with strobes can light just about anything, anywhere, to get shots that would never be even remotely possible without strobes. Even those who are lighting hackers with minimal experience (that would be me) can use strobes to get the standard portrait and product shots that are photography’s bread and butter. But strobes definitely have their weaknesses. There’s a steep learning curve associated with strobe lighting, and much of it is not intuitive. Without a lot of experience (or a lot of trial shots for the inexperienced), it’s hard to know just how that split second of high-intensity light is going to look on the image. And setting up the lights is only part of the problem. Strobes must be triggered to fire in sync with the shutter button, so they must be slaved to an on-camera flash, synced by electrical cord, or triggered by radio. Getting the lights to fire can be every bit as complicated as setting them up in the first place, especially when using radio triggers. Shoe-mounted flashes are small and lightweight but take several seconds to recharge between flashes, which severely limits fast-action shooting. Studio strobes can flash more rapidly (although often not as rapidly as we wish), but even “portable” studio strobes are fairly large and heavy setups. But until recently there really haven’t been many alternatives to strobe lighting. For most of my photographic life, continuous lighting wasn’t really a consideration. Bright continuous lights were “hot lights”—they put out enough heat to melt the makeup off of a model. There were some fluorescent “cold lights,” usually sold on eBay and ranging from nearly useless to less than useless (slow cycle lights that put out light with variable temperature shifts). Those of you who are skilled “strobists” are simply shrugging and saying “that’s part of being a photographer” at this point. Which is what my first photography instructor told me years ago when I resisted going to the darkroom: “work in the darkroom is just part of being a photographer.” Nope, not so much. I was shooting microscopy images on 1 megapixel CCD cameras, stacking 4 or 6 shots in NIH Image or Photoshop 2 to get enough resolution to make a 4 X 6 inch print. But I was absolutely certain (to the amusement of my instructor) that digital, not film, was where everything was heading. I feel the same way about lighting: continuous, not strobe, is where lighting is heading, although not immediately. Strobes will never be replaced entirely, but I believe they will become less and less commonly used over the next few years, for a number of reasons. Newer SLRs can function with a lot less light. Big powerful strobes were needed to get short exposure times shooting reasonably small apertures on ISO 100 or 200 film. New digital SLRs (and better post-processing software) mean photographers today simply don’t require as much light. Even full page glossy prints and billboards can be shot at ISO 800 on most systems, and 1600 on many. Newer SLRs have a wider dynamic range and maintain shadow detail far better than older cameras. This doesn’t eliminate the need for lights, of course, but it reduces it somewhat. For example, I recently did some interior shots for a real-estate agent. I’ve always despised this type of work; it requires lugging lights and a tripod from room to room, etc., for usually a pretty minimal fee. But I did this as a grudging favor and in my passive-aggressive way took just a Nikon D3 and a 14-24 f/2.8 lens. Shooting at ISO 3200, I got excellent shots just from the lamplight in the rooms. In some ways they were better than properly lit shots would have been. The lamplight gave a very nice, home-like appearance. The whole job took 15 or 20 minutes, rather than the couple of hours it would have required had I used lights. Almost every dSLR released in the last year has had some video capability. In some cases the video is so good that videographers and cinematographers are using the cameras in place of regular video equipment for certain types of shooting. Of course, a lot of photographers aren’t shooting any video with their cameras, but many, maybe even most, are at least playing with the video capabilities. Some photographers are going to get serious about the video features of their SLRs. Wedding and event photographers are already under a lot of pressure to provide video, for example, and a number of videographers who have bought SLRs for video are learning to shoot stills. Video lighting, while currently a bit more expensive and less powerful than strobes, can generally be used for still photography. Strobes, however, are useless for video. The “photovideographers” are going to have to invest in continuous lighting for video. Many of them will use their continuous lighting for still photography instead of buying a second lighting set (strobes). Continuous lighting is simpler to learn. I’ll assume the majority of photographers at this moment in time are at least adequately skilled in the use of strobes. But some aren’t, and new people enter photography every year. For the beginner, continuous lighting is simpler to set up. There are no cables or radio controls to trigger the flash at the proper instant. They can set up their continuous lights and adjust them to the look they want, then let the camera do the work of metering and exposure if they desire. I’ll tell you a Lensrentals secret: every week we deal with 3 to 5 people renting lighting to use for the first time. For years, we’ve spent time on the phone with them, encouraged them to get the equipment early and work with it before their shoot, and then looked at each other saying “This isn’t going to end well.” And it usually doesn’t. About half of those first time lighters never get the equipment to work properly. So lately we’ve been encouraging first-timers to try continuous lights. The difference has been dramatic. Instead of the 50% unhappy customer rate we have for first-timers using strobes, almost all of the continuous lighting renters are happy. They may not have gotten exactly the lighting they wanted, but they got in the neighborhood on their first try. I’m sure, as some of them gain more lighting experience, they will try strobes. A lot of them won’t, though, and I bet a large number of those who try strobes may still prefer continuous lights. I’m pretty sure this has always happened—new photographers who are intimidated by strobes tried continuous lighting first. The continuous lighting they try today, though, is so much better than it was 4 or 5 years ago that I suspect a lot of them will just stay with their continuous lights. Especially if they also shoot a little video. Continuous lighting has become stunningly better than it was a few years ago. Continuous lighting used to be heavy, bulky, hot, weak, and expensive. Good continuous lights are still more expensive than quality strobes, but not nearly as much as they once were. And the gap is narrowing pretty rapidly. Hot lights remain an option, but LED and fluorescent lights are virtually heat free. Some continuous lighting systems remain larger than strobes, but others are smaller and lighter than strobes of similar luminance. And continuous studio-sized lights can provide plenty of power for almost any situation (while shoe-mount continuous lights are available, they can’t approach the power of shoe-mount strobes). Those of you who haven’t tried continuous lighting recently may not realize how good it actually is. Continuous tungsten lights are quite bright, and many of them not only accept a wide variety of light modifiers (snoots, scrims, barn doors, etc. ), the light beams themselves are often focusable from spot to flood by a dial on the light source. Because they don’t need a heavy power supply, continuous lights are quite portable and therefore appropriate to use on location as well as in the studio. 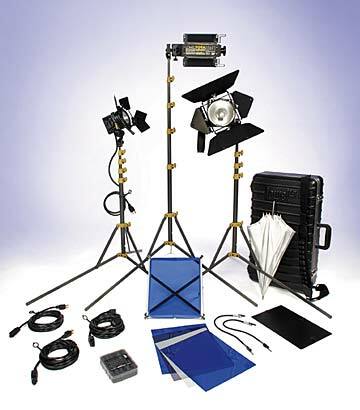 The Lowel three light tungsten set (see below) produces a total of 1500 watts combined as a spot, flood, and highlight. It fits in a 30-inch bag and weighs about 24 pounds including stands and light modifiers. A 500 watt, 21-inch tungsten softbox weighs about 3 pounds – light, power supply, softbox, everything. On the other hand, top quality fluorescent lights are generally bigger and bulkier than equivalent strobes. A 400 watt Kino Flo fluorescent bank (image below), for example, is 22 × 35 inches and weighs 14 pounds. While not appropriately portable for on-site work (unless you have a truck and some assistants), they work very well for continuous heat-free lighting in the studio. And unlike the cheap fluorescents of yesteryear, new fluorescents lights are rapid cycling so the color temperature is consistent shot-to-shot. But the biggest strides in continuous lighting are being made in LED lights. LEDs are still more expensive (up to double) the price of other forms of lighting, but the prices are dropping pretty fast. And they definitely are cool lights, in every aspect of the word. I can carry four Litepanels 1 × 1 in a large briefcase, giving me 2,000 watts (equivalent) of heat-free continuous light. If I’m working off-site, I can power each of them from a video camera battery for a couple of hours. When working indoors, I can plug the lights into a standard electrical outlet—no powerpack needed. And I can fit them with gels, scrims, barn doors, or other light modifiers. With some of the newer LED lights, like the Zylight, you can do something that’s completely impossible with strobes: change the temperature of the lights with a dial. No need for gels, filters, etc., just rotate the dial for sunlight, fluorescent, or whatever temperature you want. And they’re radio synced from the factory so that adjusting the temperature on one light adjusts all the other lights in the setup. LED spotlights, floodlights, even ringlights and shoe-mounted lights are already available, and the technology is growing by leaps and bounds. Continuous lights aren’t perfect. They’re more expensive and less powerful than strobes right now, but it’s new technology. Like any other technology, the price will drop and the products will get more powerful—a couple of years ago a 30 watt LED was about as bright as you could get, now 500 watts in a single light and 2,000 watt arrays, while breathtakingly expensive, are available. Quartz and tungsten bulbs burn out and fluorescent bulbs break, something that isn’t a problem with strobe tubes, so consumables are an additional expense with continuous lights. And there will always be certain situations where strobes will remain king for the foreseeable future. On-camera shoe-mount flashes will remain simpler, cheaper, more powerful, and more portable for single-light solutions or Strobist type on-location lighting. A decent set of studio strobes will be cheaper than a decent set of continuous lights for at least another year or two. There will always be situations where the power of strobes is simply a better solution than what can be obtained with continuous lighting (sports and action photography, for instance). And I’m sure many folks will swear by the “strobe look,” just like many photographers swear by the “film look” today. Back when I was saying I didn’t need to learn the darkroom because digital was going to replace film, I was way too early in my prediction. That was 1996, and it was another 5 or 6 years before digital really began replacing film. I’ll go out on a limb with this prediction: by 2013 more photographers will be using continuous lights than studio strobes for in-studio and on location photography, and I’ll bet the number of strobe manufacturers is significantly lower than what we have today. I’ve Shot Video… Now What? I think some of it may be geography – I’m located in the Southern US so there’s generally a good amount of light coming in through windows in addition to lamplight, etc. I was definitely not shooting at night. If I assume (???) that you shot handheld (you implied no tripod), and did so at somewhere around f8 to f11, at 1/60 sec., then the ambient must have been around EV = 7 (if at f8), or EV = 8 (if at f11). What do you think accounts for this big variance? Was it simply that you shot before nightfall, with some daylight streaming in through big windows? Or were the lights in that house simply very (very, very) bright? And do let me add that your columns are always of interest, frequently enlightening. Keep ’em coming. I also have to add, that the idea that people are wearing sunglasses in a music video because a ring light hurts is afwully thin. A good ring light is fully dimmable, and a quality production will never relly on it as a sole source. There will be several sources all around with the ring light acting as soft fill to compensate for a steadycam operater stepping inbetween the talent and one of the sources for a close shot. (Very few cameras and even few operators are transparent.) The ring light has the added bonus of putting a “catchlight” in the talents eyes. If you watch the videos more closely you will see plenty with a ring light reflecting in the talents naked eye, and plenty of sunglass wearing performers WITHOUT a ringlight reflecting. The only time a ringlight would hurt someones eyes would be if it were being used a sole source in a dark room, and if you’ve only got one sources, and its surrounding the lens, you’re going to have some of the flatest, most boring light in th world. One thing to bear in mind with continuous lights is that there is a vast range of quality in fluorescents and LEDs. Many strobists buy a lower end fluorescent or LED to test the waters,are unhappy with the results, and decide that the technology is not ready. The problem with that is, coming from the world of strobes, one of the main things you look for in a lights specs is the total light output, so you might find a cheap fluorescent that’s just as bright as a Kino Flo and decide that’s the one to try. What most people who aren’t familiar with continuous lighting are unaware of is that color rendering is an incredibly important factor, at least as imporant as output. You want a light with a CRI (Color Rendering Index) of at least 90 for most work. Without this, specific frequencies of light will be under or over represented, meaning specific colors in your subject will be over or under empasized in the final photograph. These are typically pretty fine “notches” in the overall curve of the ligths color profile, meaning the results are very difficult to predict or control. You can’t simply add a red gel to fix the lack of red, because while one very specific redish hue might be under represented, another will be over represented, meaning one subjects lipstick will look awfully dark, while the others looks cartoonishly bright. If the light you’re looking at doesn’t list a CRI rating, it probably has a pretty crappy one, don’t buy it! I’m not so sure about continuous lights taking over in the fashion that you are suggesting. In addition to the points about freezing action and balancing with ambient, continuous lights have a myriad of other limitations. Led panels and Florescents are very bulky and the good ones are considerably more expensive than strobes for their lighting output. The cheap floros have CRI issues. Tungstens are heavy and have special power requirements when you get north of a few thousand watts. HMIs can be awesome on a studio environment, but are a pain to travel with and power on location. Finally, for anyone who has seen a music video lately that used a ring light, you will notice that the subject is always wearing sunglasses. It hurts to look into the camera. That being said, I know a lot of people who do the dual stills/motion game and there are definitely cost advantages to using continuous lighting in that sort of situation. Interesting article, I’d not properly considered this after some mediocre results using continuous lighting (poor colour and low intensity). As digital cameras function well with increasingly less light, photographers will be able to make more use of ambient lighting so additional lighting, strobe or continuous, won’t be as necessary. The videographer point is important. Mr Digit is right; strobes freeze action in a way that continuous lighting can’t, also because of the need to balance against the ambient lighting. One interesting side-effect of increased use of continuous lighting will be smaller pupil sizes as people’s eyes have time to react to the additional light. An important issue not addressed in this article is that strobes can freeze action, which continuous lighting does not. If you are shooting in near darkness and want to balance ambient and strobe lighting, a continuous light is useless unless your subject is stationary. There are plenty of shots that you just can’t get with a continuous light. what is the situation now in 2011? Do you feel LED lighting has obeyed your prediction? What do you feel is the future of fluorescent now?